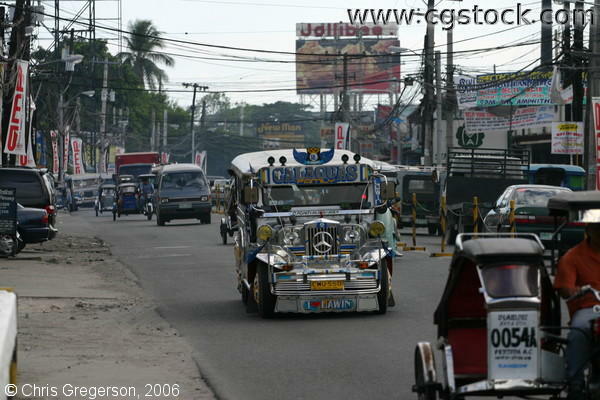 Shown here is a jeepney (jeep) which is a common means of transportation here in the Philippines. This jeep is labeled Calaguas and has colorful drawings and unique designs and details put in which make it uniquely Filipino like the antennas, the Mercedes Benz Trademark, and the wing icon on top. The big sign on the background is the Jollibee sign, which is a very famous fast food store in the Philippines (like McDonald's). This picture is a typical scene in a street in Angeles City, Pampanga.